Growth form: Perennial herb. Flowering. Mar. Status: Introduced.Common. Also recorded: E Saudi Arabia, UAE. Habitat & distribution: An escape from cultivation; the wild form occurs in saltmarshes but has not been recorded from Qatar. Uses: Cultivated as a forage. The plant has diuretic, aphrodisiac and various other medicinal properties (Rizk & El-Ghazaly). Notes: Beta vulgaris subsp. 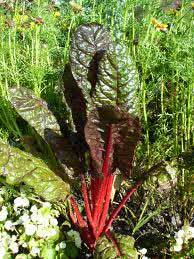 vulgaris is the cultivated garden beet and B. vulgaris subsp. maritima (L.) Arcang. is the wild sea beet.